Angela Merkel arrives in Mexico. There are questions that simply won’t go away. The one that followed Angela Merkel around her two-stop visit to Latin America was whether she is seeking a global leadership role, now that the United States seems to be pulling up the drawbridge to the rest of the world. The short answer is no. The intent is nowhere to be seen. Instead the chancellor keeps stressing her G20 preparation mission to dispel the appearance of any kind of anti-Trump alliance. The May G7 meeting in Sicily highlighted that a dynamic of six-against-the-one world power, the U.S., only deepens rifts in the West. Now the real question: Will the vacuum created by Trump in Latin America – and, more worryingly, the rest of the world – allow Angela Merkel to escape the role of “leader by default?” The short answer is no. Her trip to Argentina and Mexico kept providing evidence of that. In Mexico, her second and final stop after Argentina, the German chancellor met President Enrique Pena Nieto, who runs the country with the most free trade agreements in the world. And yet, with 80 percent of exports going to its mighty neighbor to the north, Mexico lives on a tight economic leash firmly held by the U.S.. Throw in the threat of the border wall and one gets a pretty good picture of the daily pain Pena Nieto faces in trying to fend off the rise of left-wing populism in Mexico. It translates into potential political dynamite at home that could see his PRI party ousted from power in next year’s elections. Mexico’s populism feeds on anti-American sentiment, which has unsurprisingly gone through the roof since Donald Trump came to power. 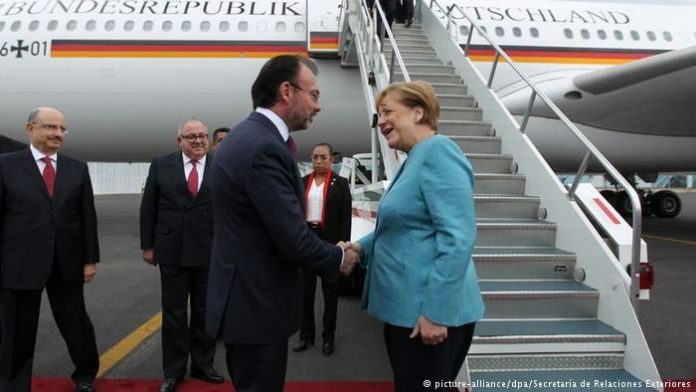 German business leaders met with Mexico’s NAFTA re-negotiator-in-chief, Ildefonso Guajardo. The optimistic spin on Trump’s policy towards Mexico is that what currently sounds like a death threat to Mexican manufacturing could become its involuntary catalyst to a more diversified future. But meeting the Merkel meant more than business for Pena Nieto, who is not known for standing up for a free press, let alone answering their questions. More than 100 journalists have been murdered in Mexico since 2000, primarily those who cover drug cartels and political corruption, especially at the local level. State protections are barely enforced as many politicians have ties to organized crime. Merkel sent a loud message when she met civil society organizations during her 20-hour visit. The hope appears to be that Pena Nieto may also start to see the role of a free press as an ally against crime, rather than an enemy in the daily battle to control his public image. Since 2015, Germany and Mexico also share an experience that has transformed both countries. The German chancellor is a relative newcomer in dealing with large numbers of migrants. The main body of some 800,000 migrants – many of them fleeing war in Syria – reached Germany two years ago when Merkel briefly suspended the EU’s typical rules for would-be refugees. Here Mexico has a head-start of sorts, having been both a transit route and a country of origin for people seeking a better life in the U.S. for decades. With the looming threat of a border wall, Mexico is increasingly trying to stem the flow of people from Central and South America towards the U.S. border. Merkel will be hoping to win Mexico’s support for her G20 initiative to improve living conditions in African countries many migrants are leaving.